I'm using an older Mac version of Excel. Is there a free Basic Skills book for earlier versions? Yes. We also publish a version of this title for Excel 2016 for Apple Mac. We do not publish version of this book for older versions than this. Which version of Excel was used to write this book? This book was written using the first public release of Excel 2019 for Mac. I'm using Excel 365 for Mac (the subscription version of Excel), can I use this book to learn Excel? Excel 365 for Mac is the subscription version of Excel 2019 for Mac. Unlike Excel 2019 for Mac, the subscription version can potentially be changed (or have new features added) at any time as it is constantly updated. Excel 365 for Mac and Excel 2019 for Mac were identical in January 2019 but could change in the future. Any changes are likely to be minor and easily worked-around so you shouldn’t have any difficulties using this book to learn Excel 365 for Mac. The Windows versions of Excel 365 are updated in a different way to the Mac versions with major semi-annual scheduled new versions (in January and July every year). For this reason we publish different books for Excel 2019 for Windows and Excel 365 for Windows. 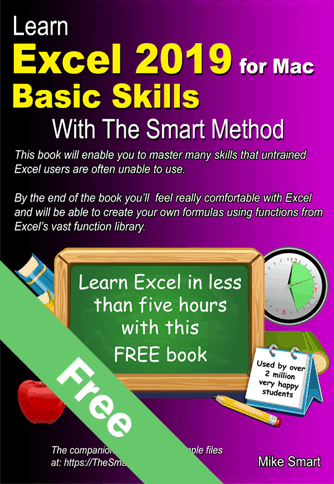 The free Basic Skills Excel for Apple Mac tutorial will get you started with Excel fundamentals. Even though it is a basic skills course you’ll still master many skills that professional Excel users are unable to use. Available entirely free as an e-book. Click here and the e-book will open straight away. Read the first two pages and you’ll immediately realize why millions of learners have found this free course so useful. Also available for Excel 2016 for Apple Mac. This book is also available for the Windows versions of Excel: Excel 2007, Excel 2010, Excel 2013, Excel 2016, Excel 2019 and Excel 365. Teaching a class? Order printed copies of this book at our not-for-profit printing cost price.